Bereaved father Rafi Levengrond founds new party, says politics don't interest him but terrorism 'has to end,' terrorist should be executed. Bereaved parents on Monday night arrived at the Judea military court to attend the trial of Asam Barghouti, who carried out the Givat Asaf shooting attack and participated in the Ofra terror attack. In the December shooting north of Jerusalem, Barghouti murdered two IDF soldiers and wounded two more Israelis. The Ofra shooting attack wounded seven people, including a pregnant mother who gave birth prematurely via Cesarean section in order to save her life. The baby, born at 30 weeks, was deprived of oxygen and blood due to the attack and died a few days after his birth. 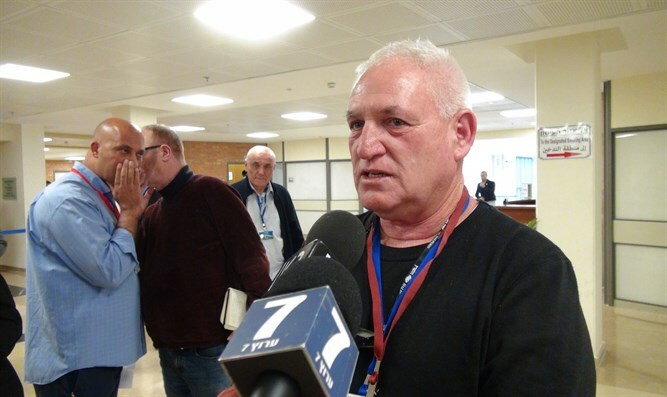 Rafi Levengrond, whose daughter Kim was murdered in the Barkan terror attack, told Arutz Sheva that only execution of the terrorist would be an acceptable punishment. In the Barkan attack, two young parents were murdered and an additional Israeli was wounded. "We demand the terrorists be executed, the families be deported, and their homes be demolished," he said. "Unfortunately this government is weak and will not allow that to happen." "From my perspective, every meeting with a terrorist and security forces needs to end with the death of the terrorist, in order to end the unpleasantness of seeing the terrorist smiling in court while the families are hurting. In my case, the terrorist was eliminated, so I was spared [that experience]. It's a shame to waste time and resources on a terrorist who did anything, even if he just wounded people. The meeting between him and security forces needs to end with death." Levengrond recently founded a new party, "Our Israel," aiming to eliminate terror. "My daughter's terrorist did not get upset in the morning and go murder someone," he emphasized. "I have photos of him and of other terrorists in vests and spotted uniforms. It's part of an army of terrorists, and there's someone standing behind them, providing funding for them. The terrorist who murdered my daughter examined the factory (where it was carried out - ed.) for four months in order to plan the attack." "The State of Israel is funding this army and transferring funds to [Palestinian Authority Chairman] Mahmoud Abbas, and we need to stop that. I don't have any faith in [former Defense Minister Avigdor] Liberman (Yisrael Beytenu), who didn't do anything, and I don't have faith in [Israeli Prime Minister] Binyamin [Netanyahu], or in [Benny] Gantz, [Gabi] Ashkenazi, and [former Defense Minister Moshe] Ya'alon, who all made huge mistakes." Levengrond also hopes that despite his lack of resources, he will make it in the elections. "No one cares about the pensioners, either," he explained. "Thousands of people call me to express support. They want to help. I don't have the resources to publicize, I do everything out of pocket, including appearances on the radio and television. Several right-wing politicians called me worried that I would 'steal' their votes, but I want a change. Before my daughter was murdered, I had no interest in politics. Today, I want to put an end to this."